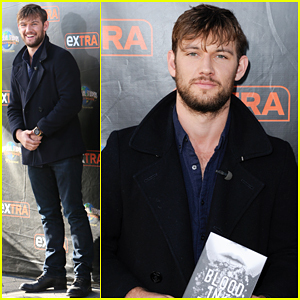 Alex Pettyfer flashes a smile as he makes an appearance on Extra at Universal Studios Hollywood on Monday (November 30) in Universal City, Calif. The 25-year-old actor is helping to promote new novel “Blood, Ink & Fire,” written by Ashley Mansour, in support of his production company. In case you missed it, Alex recently opened up about his feud with Magic Mike co-star Channing Tatum. Lea Michele Gets Terrified Snow Tubing!